VISALIA – The Lindsay Cardinals’ title defense has gotten off to a rocky start. 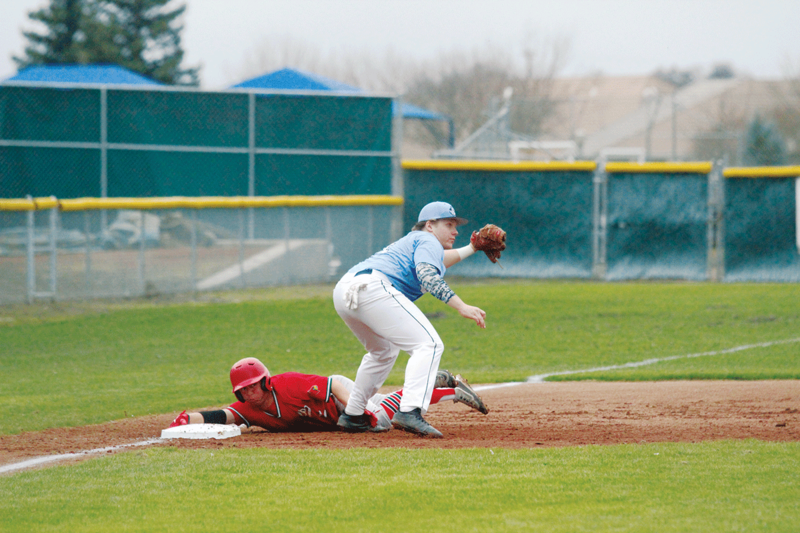 In their second game of the season on Wednesday, Feb. 13, Lindsay suffered a second loss at the hands of the Central Valley Christian Cavaliers 17-1. “We need a lot more practice to get better,” Lindsay head coach Brett Kendig said. Lindsay’s (0-2) lead off man Isaiah Franco drew a walk in his first at bat of the game. Then there were two strike outs, Franco was caught trying to steal third and the Cavaliers (1-1) were out of the top half of the first. The Cardinals’ defense did not share in the Cavaliers’ success. Lindsay’s starting pitcher Aaron Macias gave up two singles back up the middle and hit a batter in the first three Cavaliers he faced. A sacrifice fly to left brought the first Cavaliers’ runs across. When Macias walked his next batter Kendig brought in Angel Perez. Perez’s start was not any better than Macias as he struck the CVC batter on his first pitch which brought in another run. It seemed the early hits had made the Cardinals uneasy on the mound and in the field. Lindsay had two chances to turn routine double-plays, but struggled to get the force out at second. After giving up a total of five runs in the bottom of the first, Lindsay’s trend got worse in the second giving up 11. Routine fly balls where multiple Cardinals had chances of making the catch fell to the ground. “Those types of things happen a lot when we are playing rushed,” Kendig said. Things got worse for the Cardinals in the second inning when centerfielder Jose Arredondo slid to catch a fly ball. The ball seemed to curve in mid-air and struck Arredondo directly in the face. He was taken to the emergency room, and treated for a possible broken nose. “It’s an unfortunate thing that happened,” Kendig said. Lindsay’s first couple games however has been a baptism by fire for the defending Division VI Valley Champions. A couple weeks ago the Cardinals lost 10-0 to the four-time North Yosemite League Champions and Division II contender the Fresno Warriors (2-0). The addition of the 2017 Division V Valley runners-up was something new to this season, but will definitely add some strength to the Cardinals’ schedule. Lindsay played the Orosi Cardinals on Tuesday night in the first round of the Immanuel Tournament which finished after press time. The tournament concludes on Saturday, Feb. 23. Sports reporter for The Sun-Gazette.